Hi folks – today I have a bonus post in honour of Remembrance Day that is a little bit of a departure from my previous posts. Don’t worry, for the faithful few that follow this fledgling blog, the usual Thursday post will still be up this week. A few weeks ago I was walking along King Street at Simcoe Street when I happened across a small A-frame sign in front of St. Andrew’s Church that said “48th Highlanders Museum: Open.” I had never heard of the museum nor had I been inside St. Andrew’s Church, and I had some extra time that morning so I thought I would stop and check this place out. I didn’t have the presence of mind to take pictures or write anything down, so everything that follows is as close as possible to my memory of my experience when I thought to write it down a few hours later. The entrance to the museum was a locked metal door at the bottom of a small staircase in the front of the church. The little paper signs taped to the door explained that the museum was open from 10 AM – 3 PM on Wednesdays & Thursdays, and also that it was run exclusively by volunteer members of the regiment. I rang the buzzer and was greeted by an elderly man in uniform (I introduced myself, but unfortunately I never got his name). I was expecting to meander through by myself in a couple minutes, but this man was happy to lead me through the museum from start to finish, explaining what I was looking at and telling excited stories from twinkling eyes behind his glasses. I never asked and he never really offered, but soon I found myself following my shuffling guide through this basement museum. He told me he was part of the regiment from 1948 to 1951, but he “never had to go anywhere.” He started off by encouraging me to join the regiment (I could even do so part time! ), or at the very least I could purchase a nice kilt or ostrich-feather hat for a thousand dollars or so. He showed me the uniforms the 48th Highlanders of Canada wore during WWI, which included their kilts as well as kilt coverings that were thicker and more colour-appropriate for their taupe jackets and hats. He said that these men were well known by the Germans in WWI, who apparently referred to them as The Ladies from Hell, because of the rare and I suppose off-putting combination of traditional Scottish garb and ferocity. Later I found out that nickname was claimed to be given to almost any Scottish infantry sporting kilts during WWI, not exclusively the 48th. Either way, my guide was pretty proud of the moniker. 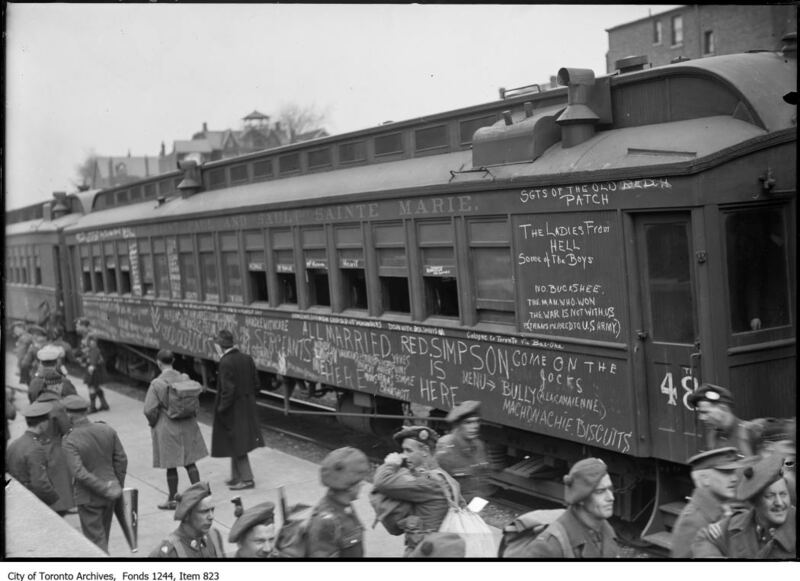 A train arriving at Union Station bringing the 48th highlanders home from World War I. Note “Ladies from Hell” on the side. He then showed me these powdered white jackets that were worn in the early 20th century, telling me that they used chalk to keep them looking fresh and bright white. Of course, one had to be careful not to wear it to a dance if your wife wore a black dress, because she would be upset that you spoiled her outfit. Later on, when describing different types of mortars they used during various wars, he told me about mortars that were stored in silk bags, and how some men used to try and take the silk to give to their wives or girlfriends for their sewing. You had to be careful if you did that, my guide chuckled. Another highlight was a glass case entirely devoted to a man named James Fraser, the legendary longest serving Pipe Major in the 48th who was renowned for his skill with his pipes, his meticulous drawings of full books of music by hand, his strict temperance, and even stricter abstinence from foul language. My guide told me he would quickly scold anyone in his presence for cursing, and he also received a 30 year temperance medal. 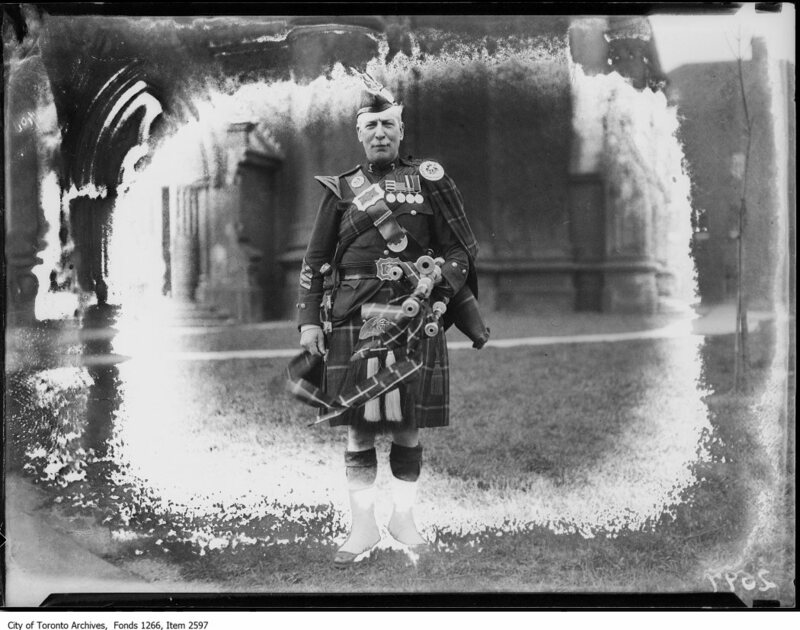 Pipe Major Fraser in 1924 looking sharp and self controlled, as usual. Among much else, there were cases of coins, rifles, a painting of a Nazi general signing a surrender in 1945, tons of different uniforms, personal effects of various soldiers, pictures of countless Queen’s Park marches, a picture of Queen Elizabeth’s visit in 1997, examples of food normally eaten while in the field, including hard tack so rock hard it was signed by some men from the regiment. 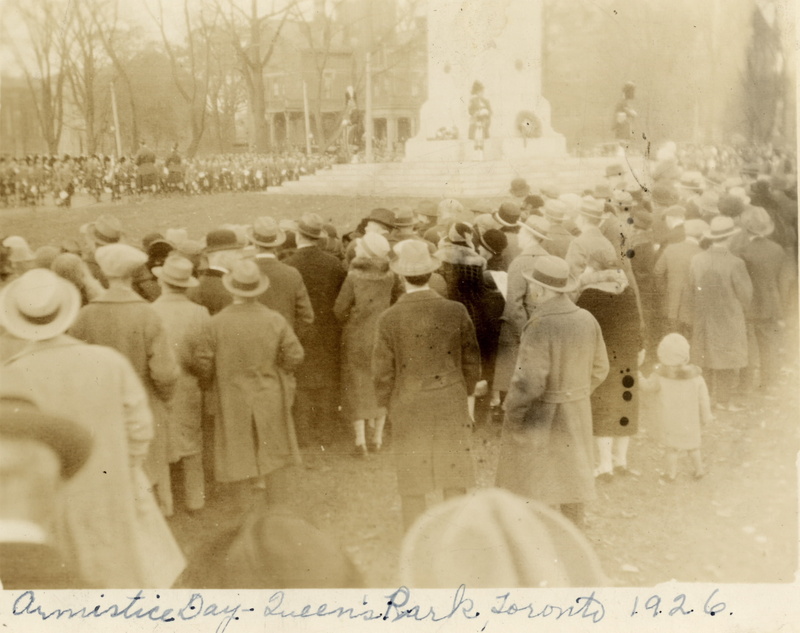 Armistice Day (the predecessor to Remembrance Day) at Queen’s Park in 1926. A memorial to the 48th highlanders remains at Queen’s Park to this day. While most most of my visit was illuminating for me in terms of capital H History, that is, the things regarding the particulars of the 48th highlanders and their History at war and at home, I also got a strong sense of pride from both the man and the items filling the cases. One thing stood out to me that spoke more strongly than any artifact did though. My guide told me they had some old 48th highlander medicine on display, pointing at a bottle of scotch behind the glass. Later, he told me a story about a friend of his who he had a drink with every week these days, who happened to get too drunk last week and almost started a fight in the bar they were at. Now I don’t really know this man or any of his fellow 48th highlanders, but I still think I got a bit of a glimpse behind the pride and the pomp and the parades. It got me thinking that “supporting the troops” maybe shouldn’t necessarily be about supporting military action as I’ve always thought or assumed. I think I realized that it should be about supporting, listening to, and caring for the individuals who have had often devastating experiences with war and are ever dealing with the effects, regardless of how you feel about the necessity or uselessness of war. I highly recommend checking this museum out (which is free but encourages donations), even if only to spend some time allowing a person to share a little bit of their story.